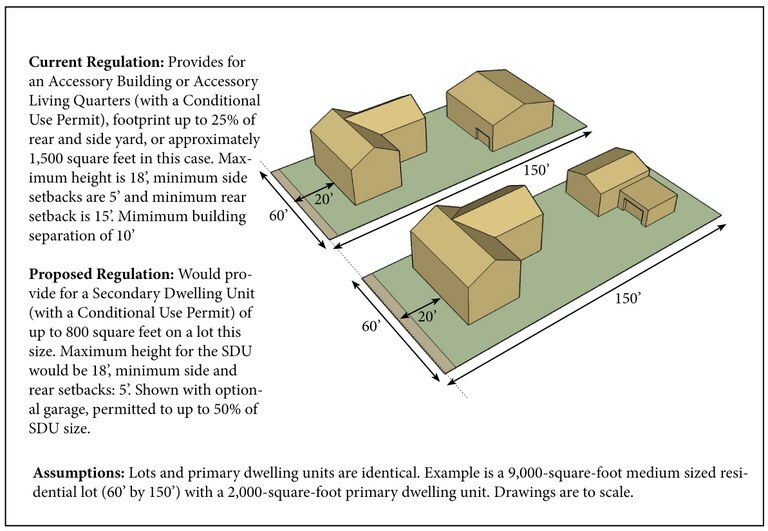 Proposed Zoning Code amendment regarding Secondary Dwelling Units. 1/15/2016: The LUPZ committee heard O-14-20, the Secondary Dwelling Unit legislation, on January 13th. Around 30 members of the public came to speak on both sides of the issue. After listening to public comment, the committee forwarded the bill to full Council with no recommendation. As written, the legislation does not include the R-1 zone. O-14-20 will be on the full Council agenda for Monday, February 1st. This meeting begins at 5:00. 12/31/2015: The LUPZ hearing that will have the Secondary Dwelling Unit legislation on it's agenda is scheduled for Wednesday, January 13th at 5:00. 12/7/2015: At it's November 12 hearing the EPC decided to send the legislation back to City Council, with a recommendation that the Council reconsider having the ordinance affect the R-1 zone. This item will go to the Council's Land Use, Planning and Zoning (LUPZ) committee in January or February. We will update this webpage with information on the LUPZ hearing when it is available. 8/4/2015: At the August 3 City Council Meeting, the Council considered a Floor Substitute version of this legislation that removed language amending the R-1 zone and would instead make Secondary Dwelling Units a conditional use in the RO-1, RA-1, R-LT and R-T zones, and permissive in R-G and R-2. The council voted to accept this Floor Substitute for consideration, but then voted to remand it back to the Environmental Planning Commission for reconsideration of the changes proposed. It is expected that this new version of O-14-20 will be considered by the EPC sometime in October. You may read the Floor Substitute version of O-14-20 by clicking here. This proposed text amendment to the Comprehensive Zoning Code would make Secondary Dwelling Units, or SDUs, a permissive use in the R-G and R-2 (apartment) zones, and a conditional use in the RO-1 and RA-1 (large-lot single-family) zones and the R-LT and R-T (townhouse) zones. to ensure compatibility of new SDUs with the neighborhood in which they are located. These proposed amendments would not allow subdivision of an existing lot or the conversion of an existing structure to a duplex or apartments – new SDUs would have to be subservient to the primary dwelling unit and located in a separate, smaller structure. The zoning code currently allows “Accessory Living Quarters,” which are not permitted to have kitchens, a regulation that has proven vague and difficult to enforce. These proposed amendments would remove that existing loophole while protecting neighborhoods with extra requirements for height, size, design and parking. The overarching intent of these amendments is to allow another housing option to meet shifting demographic demands, such as aging populations that want to live closer to relatives.